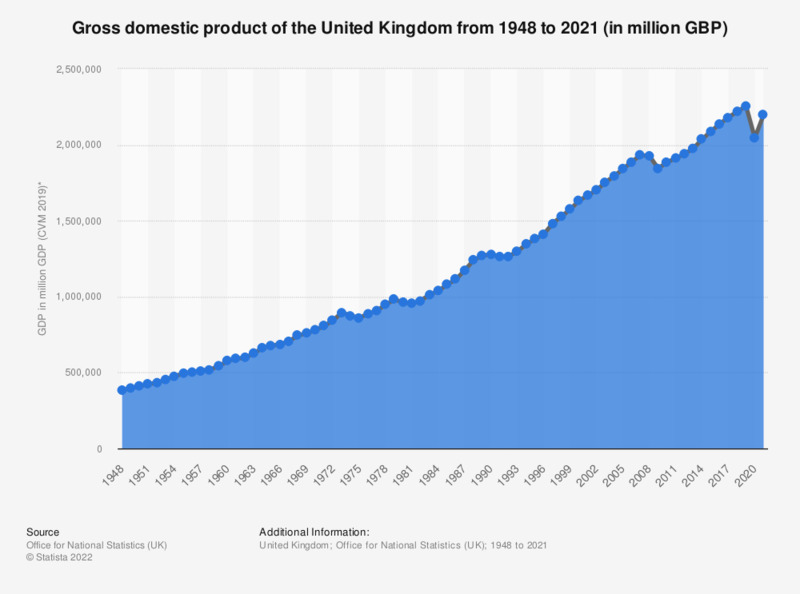 This statistic shows the gross domestic product (GDP) at current prices of the United Kingdom (UK) from 2000 to 2018. From 2000 to 2008 gross domestic product increased each year, with the exception of 2009, whereby there was an annual decrease and UK GDP dropped to pre-2007 levels, this anomaly was due to the 2008 global financial crisis. By 2010 the market had recovered and from then until the end of this period UK GDP increased, reaching over 2.1 trillion British pounds by 2018. Although the UK's economy has shown a net increase during this time period, the growth rate has slowed in recent years. In 2014 the UK's economy showed a year-on-year increase of 3.1 percent, while in 2018 this had decreased to 1.4 percent.